Meet Four Cheese, Annie's cheesiest and most decadent boxed mac and cheese yet! 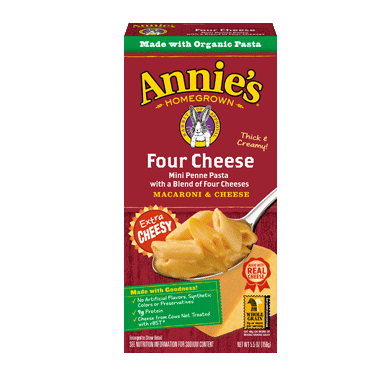 Annie's Homegrown Natural Four Cheese Macaroni & Cheese is thick and creamy. Ingredients: Organic Wheat Penne Pasta (Organic Wheat, Organic Whole Grain Wheat), Cheddar, Monterey Jack, And Parmesan Cheeses (Cultured Pasteurized Milk, Salt, Enzymes), Corn Starch, Nonfat Dry Milk, Butter (Cream, Salt), Whey, Salt, Ricotta Cheese (Whey, Butter, Nonfat Milk, Lactic Acid, Salt), Cultured Whole Milk, Sodium Phosphate, Onion Powder, White Pepper, Annatto Extract For Color, Silicon Dioxide (Anti-Caking Agent). CONTAINS MILK AND WHEAT INGREDIENTS. MADE ON SHARED EQUIPMENT THAT ALSO PROCESSES EGG AND SOY. Annieâ€™s four cheese macaroni and cheese is delicious and wholesome â€“ a much healthier (and tastier) alternative to that blue boxed mac and cheese most of us grew up with. While perfect on its own, I like to add sautÃ©ed mushrooms and onions when I make it, or even sometimes my homemade pasta sauce. It is creamy and decadent and totally a fantastic comfort food. I highly recommend this product!